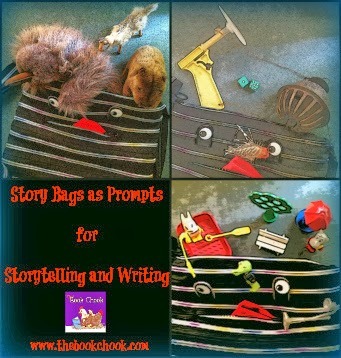 Story bags are wonderful zero-tech tools that work well for both children’s story writing and their story telling. I like to use them with children who find it hard to start from the abstract. A story bag contains things that are real and physical - often holding an object, or arranging several on a surface seems to unleash creativity. At home, story bags make fun games that allow kids to practise vocabulary, practise sequencing a story, and gain confidence with speaking skills. Changing the objects in the story bag keeps the game fresh, and objects can be tailored to children’s interests and needs. A story bag also make a wonderful activity to take on a family trip. In the classroom, story bags are useful as prompts for both oral storytelling and writing. Kids working in groups can draw out three or four items and should include those objects somewhere in their stories. Small toys, LEGO pieces, small household objects, weird and wonderful items from junk sales or the tip - all make great fodder for a story bag. You can see some examples in my story bag above. Older kids who think they’re "too old" for objects (they’re not!) can try a story bag activity with small cards. Add another dimension by having a bag for character names or types, a bag for where the scene takes place, and a bag for the story problem, climax or resolution. A story bag can be such a useful tool to include in story time at the library. I like to start by having kids make predictions as to what MIGHT be in the bag (a purple penguin), and then what is more LIKELY to be in the bag (a key.) Sometimes I’ve included objects that might give a clue as to the story I’m about to read. Depending on age, a child can then reach into the bag to draw out an object, perhaps trying to name it before it appears. Younger children might be content with naming; older kids might like to describe the object, invent a different name for it, tell a little story about it. You can also ask kids to make a story bag for a partner at school, for themselves or for a sibling at home. Remind children to be on the lookout for items that will work well in a story bag. They might like to think of themes that draw items together (from nature, weird and wonderful, mysterious) or just try for a group of completely disparate objects. In my experience, the stranger the combinations, the more participants need to think creatively. Kids can also invent story bags as guessing games (blindfold the guesser) or as prompts for 2 minute speeches. Extend the idea of a story bag by having children use cameras to snap pictures of their objects. They can then weave a digital story around them, perhaps by adding captions to images, the way I did in Visual Story Telling. Or children can create a story from the cards they draw out of a story bag, then set up scenes to photograph them as an accompaniment to their stories. Elizabeth Anne! Comment ca va?